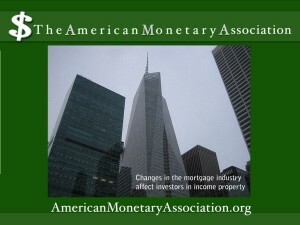 Mortgage Industry Changes: Boon for Housing Investment? The home mortgage industry is drowning under lingering foreclosure cases and rising demand for home loans and refinancing under current favorable rates. A recent Reuters article on small business finances reported that a number of leading US financial institutions are hiring additional staff in response to a surge in demand for home loans, and profit margins for institutions dealing in home lending are at double their usual level. This upswing in mortgage lending comes at a time when banks and the courts are still struggling to process a backlog of foreclosure cases held over from the recent housing collapse. But this chaos in the mortgage industry offers positive news for investors following Jason Hartman’s recommendations for profiting from rental income property, thanks to lower interest rates and the continuing availability of foreclosed properties for purchase under good terms. In September 2012, the Federal Reserve announced plans to – every month. This comes as part of an effort to create a stimulus for the housing industry. Home loan rates have fallen as a result of the Fed’s buyup of all these loans, but more slowly than some experts have predicted. This means that the potential savings for mortgage holders looking to refinance their properties may be in flux for the next few years until the mortgage industry regains balance. A cornerstone of Jason Hartman’s strategy for income property investing is the 30 year fixed rate mortgage on rental income property. This kind of arrangement locks in the payment rate for the probable life of the investment and allows rental incomes to pay off the debt. Other benefits arise from debt in income investing, too. And these benefits aren’t available to the owner who paid off the mortgage and now owns the property free and clear, with equity. Free and clear ownership of an investment property places all risk on the owner, and equity is always vulnerable. When properties are heavily mortgaged, most risk is actually assumed by the lender, with the potential for bailouts and grace periods in the event of emergencies. Investors can also leverage debt to increase returns in the long term, and continue to use borrowed funds for the life of the investment while keeping their own money in the bank. Even inflation can be beneficial, reducing the value of the assumed debt. And because rates are generally low, it can be possible to finance multiple properties in different markets for a diversified portfolio.